The UHP-H1 is the most ambitious media player from Sony in years. It's positively brimming with advanced image processing, and it's compatible with Hi-Res Audio in all its many confusing guises. But in a year when 4K Blu-ray is finally becoming a reality, does it really make sense to buy what is essentially a souped-up 1080p Blu-ray player? 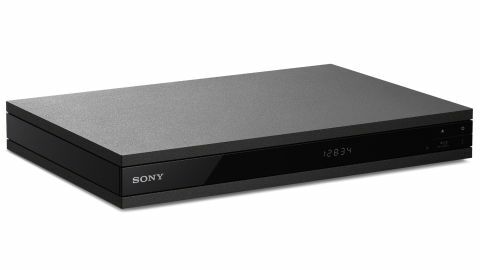 Perhaps rather pointedly, Sony isn't selling the UHP-H1 specifically as a Blu-ray player. In Japan it's marketed as a 'Premium Audio and Video Player.' Indeed, with its golden Hi-Res Audio badge, this could be construed to be more high-end audio deck than movie machine. If there's a grey divide between movies and music, this machine straddles it. What's not in doubt though, is that this represents a step-change in disc player design. The company's Blu-ray electronics have always been rather good, but more often than not they've been put together like a Kinder Surprise toy. But this is different – in fact, it's beautiful. The UHP-H1 is weighty and substantial, with the glossy cosmetic trim is bolted on top of the main bodywork. The player also employs what Sony describes as a Frame and Beam chassis. It features internal bracing to improve rigidity, while the anti-resonance feet sit on embossed ribs. The outer finish has a premium textured feel, while beneath the lid there's thoughtful architecture with short signal paths and audio grade capacitors. The front panel design is tidy, with a covered USB port and eject and power buttons organised to the right. The rear panel features two HDMIs (intended for separate audio and video use), alongside phono stereo, coaxial and optical digital audio outputs, plus Ethernet LAN. Naturally the deck has Wi-Fi, dual-band using two aerials in a MIMO configuration. It also supports Bluetooth. The remote control is a nicely sized doofer, with rubbery buttons. Emphasising its role as a content machine, the home page is busy with apps. Services include Netflix, Amazon Video, BBC iPlayer, Demand 5, YouTube and Spotify. The player also offers Playstation Now, Sony's subscription games service. Yes, you really can connect a DualShock 4 controller. We first saw this functionality land on Sony Blu-ray players late last year, and it's joined by Playstation Video, a movie and TV streaming service. To make the most of internet-delivered sources there's IP Content Noise Reduction Pro, a familiar edge-smoothing algorithm here updated with more data garnered from ever-improving streaming services. In operation, the player is positively speedy. I went from tray out to onscreen menu with a generic Java-heavy movie disc in just 40 seconds, while a lightweight concert Blu-ray did the same in just 27 seconds. In the sluggish world of Blu-ray, this is pretty fast. The transport mechanism is made from virgin ABS. Typically, a Blu-ray transport is moulded from recycled ABS, but manufacturers can pay more for premium grade ABS, which is what Sony has done here. The tray is solid, with no rattles. Picture quality is terrific. The deck may not play 4K Blu-rays, but it'll upsample if you have a 4K telly. There are a large number of set-up options. The player's output resolution can vary from lowly 480i to 2160p. Sony's own Super Bit Mapping technology has been upgraded to a 16-bit iteration, which means it'll smooth out unwanted colour banding before upscaling to 2160p/60, with 4:4:4 colour subsampling. So how good is this upscaling chicanery? I set up a shootout between the UHP-H1 and Panasonic's UB900 native 4K player. Dwyane Johnson FX actioner San Andreas, in 2K and 4K respectively, showed little difference in the way of clarity. There were differences, but these were principally due to HDR grading and extended colour; in terms of detail the pictures looked largely indistinguishable. A variety of Blu-ray playback presets are accessible via the Options menu: Direct, Bright Room, Theatre Room, Auto and two custom modes. The latter enables you to apply all sorts of processing tweaks. Texture Remaster, Super Resolution, Smoothing, Contrast remaster, Clear, noise reduction, plus contrast, brightness and colour. For this audition the player was left on Auto, not least because if I went off exploring the different combinations I'd still be playing now. The deck itself is whisper quiet in use. Sonically it's also a peach. A typical home cinema setup would have a Blu-ray player bitstreaming out to an AV Receiver for Dolby True HD or DTS HD MA. However, I think it may be advantageous to let this player do the conversion onboard, depending on the vintage of your AV receiver. The H1 features top-flight PCM processing. File support covers most formats, including FLAC and DSD 28MHz/5.6MHz. This means, for example, that you can rip your vinyl on Sony's HX500 turntable and play the DSD files through this deck; however, you do need to install the Media Server app from the All Apps menu to play back over a LAN. Across a network, the player handles everything up to DSD2.8MHz. My FLAC rip of Iron Maiden's Book of Souls stomped with almost classical fidelity. Not only will the H1 play most every file format of note, the deck is also compatible with Super Audio CDs and (perhaps surprisingly) DVD Audio discs – good news if you have a legacy disc collection, or are a die-hard collector. Panasonic's DMP-UB900 is also a great-sounding, similarly versatile Blu-ray player, but I think the H1 pips it sonically, and for several hundred pounds less.